My appetite is back and that is not fun! The first several days post-op I didn’t really have an appetite. Now that I am feeling better, I have an appetite. It is a weird thing to describe, I am not REALLY hungry because I am getting all of my nutrition from TPN, but I still have cravings that I want to eat food. I think the best way to describe it to someone that has not been on TPN or not allowed to eat for awhile is to think about a time when you were offered a cookie a few hours after a meal. You are not physically hungry, but you think about the cookie and you crave the cookie and eat it, not because you were actually hungry and needed to eat, but rather the cookie sounded good. I am having major food cravings! Everything sounds good to me! Every commercial for food makes me want to go out and buy that food! I feel very fortunate that my doctor is allowing me to eat some hard candy for pleasure. I have done a ton of candy shopping and likely have enough to last me for the next year! 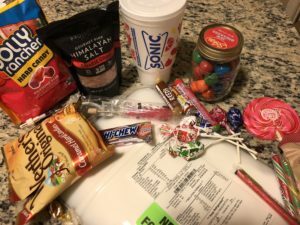 Here is a picture of my current fuel, TPN, Sonic ice, course sea salt, and all of the candy!! I am having labs drawn tomorrow morning and then I will drive back home. It will be nice to continue my recovery at home and not a hotel.